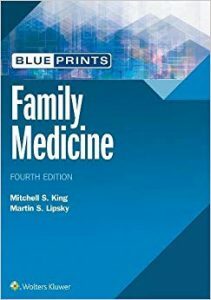 Blueprints Family Medicine provides a complete, yet succinct review of the key concepts and topics that students need to know for a four- to six-week family medicine clerkship. With its concise, well-organized format, it serves as an ideal rapid reference for day-to-day patient care as well as subject examinations and board review. Updates throughout reflect the most current treatment and management strategies.A new section covers the 25 drugs most commonly prescribed in the primary care setting.Case vignettes demonstrate clinical applications.100 USMLE-style review questions, with full explanations, facilitate exam preparation.Key Points at the end of each chapter summarize important information.Clinical boxes highlight clinical manifestations, differential diagnoses, and treatment options.A helpful appendix provides easy access to evidence-based resources.